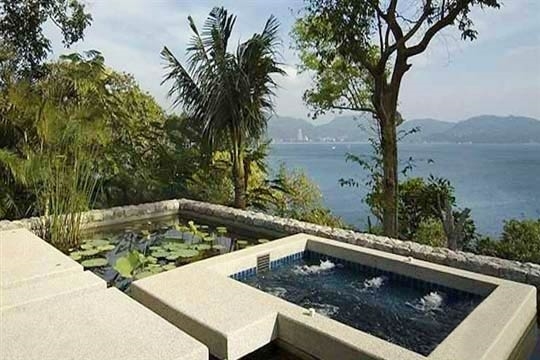 Architecturally inspiring 4-bedroom villa in the ultra-exclusive Samsara Estate on Phuket’s west coast overlooking Patong Bay and the Andaman Sea. 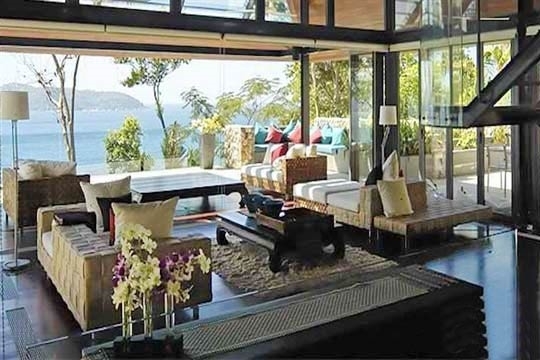 Offering ocean-view privacy 55m above sea level, this luxurious villa boasts plenty of diversions; infinity pool, personal gym, sauna, pool table and home theatre with 96-inch projection TV. 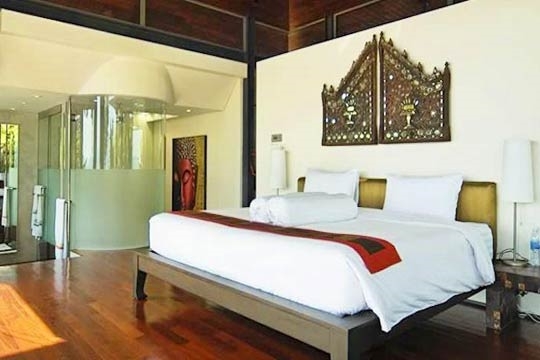 Leelavadee Villa celebrates its sea views throughout its glamorous three-floor, four-bedroom spread. Space blends seamlessly from indoors to out where full length glass doors spill onto large private ocean-view terraces designed for relaxing and dining. Highlighted by modern Asian decor - triangle cushions, Buddha statues and Thai artwork – this hillside villa offers not only comfort but also plenty of entertainment in the form of an infinity swimming pool, a personal gym, a games room, a sauna, a magnificent home theatre and built-in sound systems. 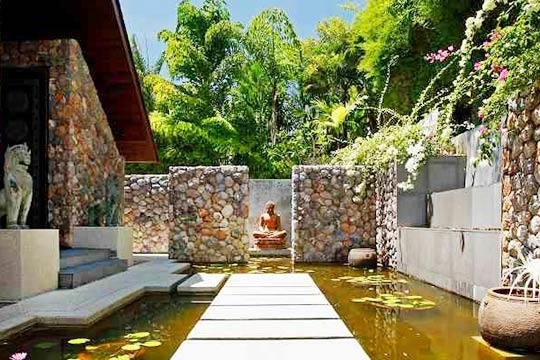 Efforts have been made to harmonise the villa with nature; gorgeous lotus-adorned ponds accentuated with stepping stones and statues grace Leelavadee with tranquillity whilst winding pathways and hidden courtyards enhance the feeling of space. 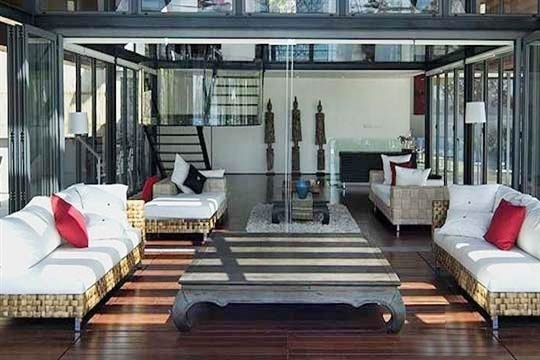 The living areas of the villa are relaxing and understated. Through an extensive use of glass you can soak up the panoramas whilst luxuriating in sumptuous beds, cushioned sofas and modern lounge chairs. 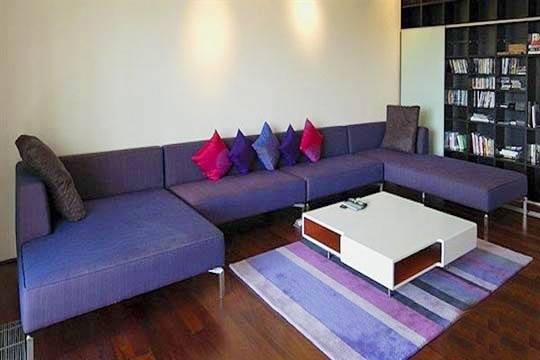 A private office even allows any business to be taken care of whilst away. The pool terrace feels like a rooftop since the master bedroom’s wood-tiled roof protrudes like a pyramid from the far end whilst the games room can be uniquely viewed through the base of the swimming pool. On the far side is a spacious dining terrace enclosed by a foliage-covered wall with a built-in BBQ perfect for alfresco entertaining; speakers in the wall can potentially transform any event into an occasion. 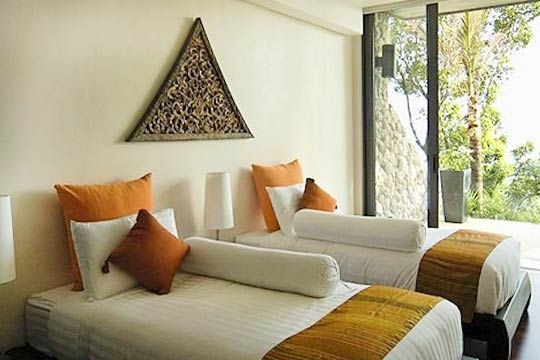 Leelavadee is air conditioned throughout and serviced by a live-in housekeeper and an excellent cook who graciously take care of you during your stay. Food, on guest account, is prepared according to a menu and shopping can be done (for a 15% fee on top of food costs). Your guest relations officer will carry out any request with ease from the most mundane to the more extravagant; babysitting, tee times, in-villa massages, island tours, extra villa security, helicopter rides, firework displays and yacht charters, to name but a few. Despite the villa’s secluded location, a selection of beaches are nearby whilst golf courses and shopping malls are within a 30-minute drive. A chic sophisticated ocean-front residence with onsite staff and full facilities. 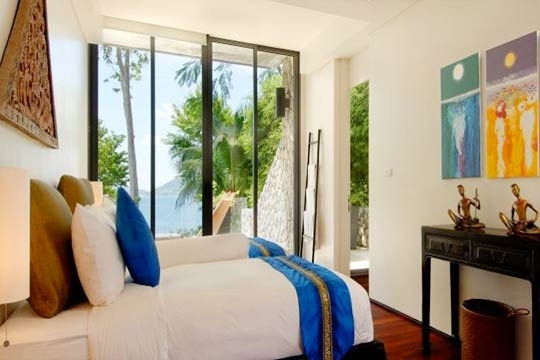 Villa Leelavadee is located on a headland between Kamala and Patong, on the west coast of Phuket. 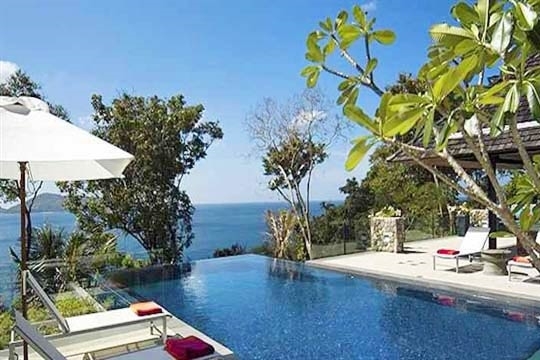 The villa, part of the exclusive Samsara development (which includes Villa 2, Villa Benyasiri, Villa Fah Sai, Villa Hale Malia, Villa Lomchoy), is down an isolated twisting service road 3km from the main Patong to Kamala coast road. The villa is remote and a car is essential if one feels the need to go out. 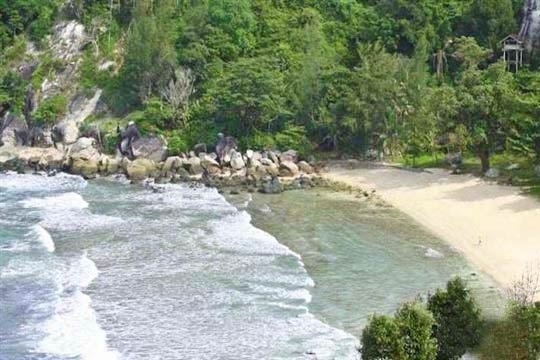 There is no direct beach access from the villa which is perched high on the headland, however there is a small (apparently unnamed) sandy beach within walking distance from the estate, and Kalim Beach is just a few minutes’ drive away. The villa is ideal for guests who are looking for a relaxing hideaway vacation and are content to enjoy the luxury of a fully serviced villa holiday. Staff are on hand to provision for food and beverages however, should you wish to shop, Jungceylon at Patong (10km) has a Carrefour supermarket, pharmacies, banks and money changing facilities as well as a range of restaurants. The entrance to Leelavadee is via stepping stones over a serene lotus-scattered courtyard pool where frogs languish lazily on lily pads and a Buddhist statue provides divine inspiration. From the entrance, steps lead down a circular staircase into the main living room with furnished front verandah looking out to sea. 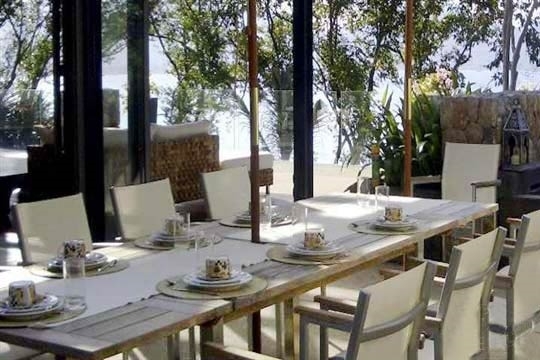 Glass doors bring in light and take you onto an alfresco dining terrace with BBQ bar and built-in speakers perfect for any occasion; from an intimate family lunch to a more jovial evening celebration. A guest bathroom is located to the rear of the living room whilst to the back is a western-style kitchen that opens onto a formal dining area for eight. 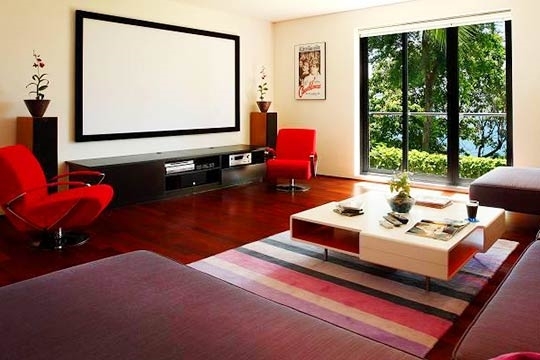 To the far side of the dining room is a study with desk, sofa seating and satellite TV. Bedrooms and entertainment areas are all located on the floor below. 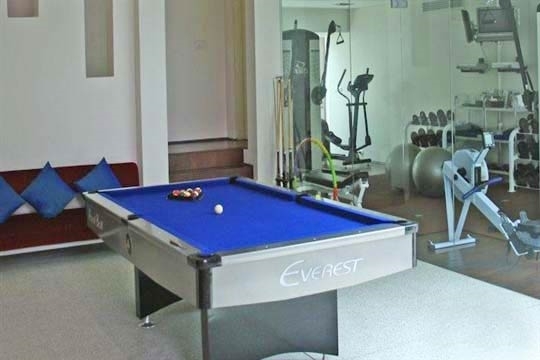 Here you will find a games room with pool table, wall mounted TV, stereo system and doors onto the garden; a glass-walled fully-equipped home gym and a home theatre with 96-inch projection screen, DVDs, board games and CDs. The master bedroom offers open-plan comfort with a king-size bed, a private ocean-view terrace with heated jacuzzi ‘island’ plunge and a sunken sea-view bathroom with twin washbasins and a shower. To the rear is cupboard storage space, a mini-fridge and a stereo. To the far side of the games room are the three other bedrooms. The first two to be reached are both twins, ideal for children since they share a sea-view balcony and are almost identical in size and design. Whilst the first twin has a bathroom across the corridor with tub, shower and sauna, the second is ensuite with both an indoor and outdoor shower as well as an alfresco bathtub. At the end of the corridor is the junior master suite which has a four-poster king-size bed, built-in stereo system, wardrobe with mini-fridge and an ensuite bathroom with twin washbasins and a shower. 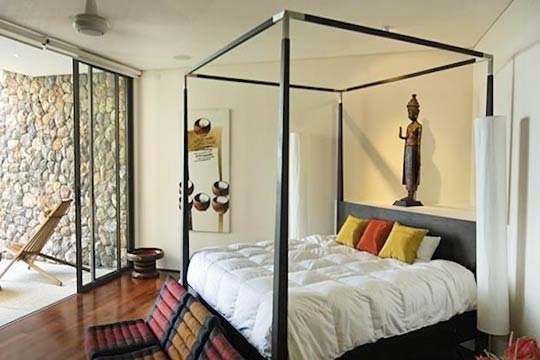 Ideal for a couple, this bedroom also has a small private terrace with outdoor shower and plunge bathtub. 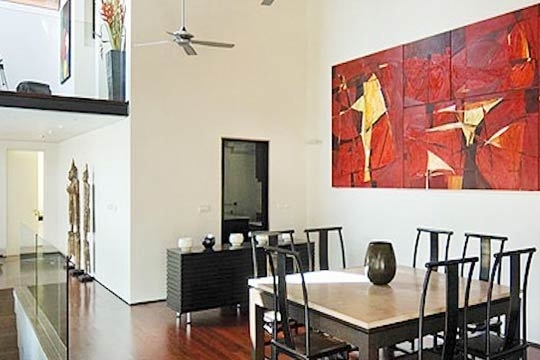 4 bedroom villa located in Kamala, Phuket. Ideal for Beach in ten, Body and soul, Bring the relatives, Executive escape, Kid friendly, Going for golf, Party pads, Room with a view.